Last night I went swimming for the first time since March (thank you blog!). There is a pool in DC that is free for residents ($4 for Virginia Lovers like me) that is amazing. It’s right off the Tenleytown metro and it’s an Olympic sized pool with about 10 lanes designated slow, medium or fast. I met my friend Amber and we picked a Medium speed lane and were the only ones in it for the first few minutes. But then, one by one people started joining our lane and before I knew it we were up to 7 people all in a row, so I switched lanes. I ended up doing 1 mile in 45 minutes, and it was HARD. That is 16.5 laps (33 lengths) and for the first few laps I didn’t think there was any way I’d finish. But, once I got up around lap 9/10, the end was in sight and I was able to power through. After the pool, we hit up the Whole Foods right at the metro for some grub! I did a base of spinach and kale, with a bunch of random things on top including a corn and edamame salad, smokey pasta mozzarella salad, ravioli, roasted corn, seitan, and curry tempeh. I’m sure there were a few other things hiding but I was SO hungry by that point that I gobbled the whole thing down in no time. Yum. So I have to give my sister Heather credit for this because she’s the one who told me (THANK YOU HEATHER! ), but I just discovered the BEST way to make steel cut oats so you can just heat them in the morning and they are ready. 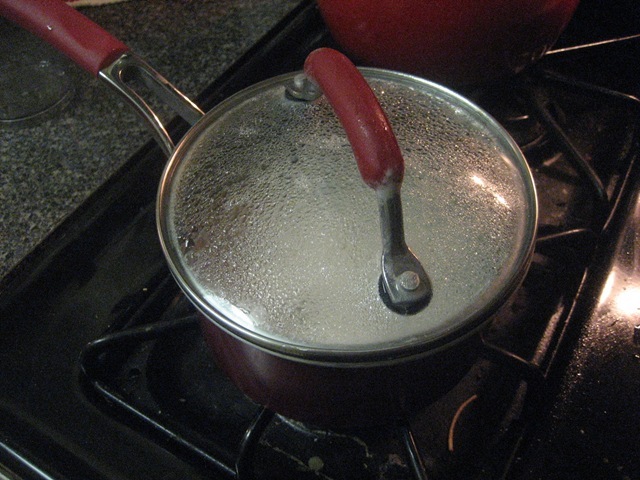 Bring to a boil over medium heat, and let boil for 2 minute. 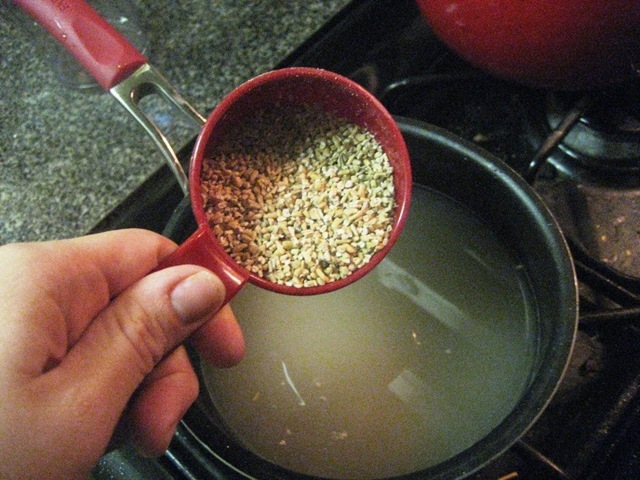 Remove from the heat, cover the pot, and let sit out on the stove overnight. In the morning, the oats will have soaked up all the water and are ready!! This is the point where you can stir in pumpkin or add anything else you want to the mix. Put them back on the stove and heat them through, and enjoy! I went with Almond Joy Oats, topping them with sliced almonds, coconut flakes, and dark chocolate. How I missed steel cut oats!! They have such a nutty and slightly chewy texture that you just can’t get from other types of oats. They have slightly more fiber than rolled oats so they are a little more filling in my opinion, and I just love them. I’m so glad I figured this out because I have a whole container of them in my pantry and seemingly never enough time to make them in the morning – not anymore! Have you ever tried steel cut oats? Do you like the texture? I have never had steel cut oats — but I’ve heard the texture/taste is really delicious. I have a recipe to make them in a crockpot — and then you just take out the right amount each morning and heat it up — kind of like what you did! Ooohhh… I like that idea! Maybe it’ll help me get through the crazy amounts I have stocked up. My only thing is I like mixing mine with milk… I wonder how it would do sitting out? I mean… it would be heated… so that’s ok maybe? Hmmm I’d be nervous to do this with milk because they absorb the liquid best at room temp and leaving milk out overnight, even if you heat it back up, scares me. i LOVE steel cut oats. i’ll have to try the overnight method…thanks for sharing! Funny, I was forced to make steel cut oats on Monday because I ran out of everything else and I did SOMETHING wrong because, ewww, they were NOT good! This seems easy enough-I’ll definitely give it a try! Ohhh give them another go because I LOVE them! Is the pool you blogged about the Woodrow Wilson Aquatic Center? I really want to check it out. I’m just nervous about it being waaaay crowded. That’s the one! It depends on when you go but its usually not so bad. I definitely recommend checking it out! These looks so easy! I should try it. I would be nervous leaving them on my stove because my cats tend to knock things over at night while I’m sleeping. I could stick them in my turned off oven for that night though! What an awesome way to cook them. I’m always so rushed in the morning that I would love to let them cook overnight then go. Do you think I could reheat them in micro at work instead of still on the stovetop? I guess I could try it. The almond joy oats sound goooood!! Congrats on the great swim! I love steel cut oats! I make a huge batch on my day off and then portion it out for the week. I really need to rethink my toppings though – I’m pretty boring and only use a few things. great tip! i have some steel cut oats sitting in my pantry that i am too impatient to wait for in the morning. now i can make them the night ahead. What a great way to workout! I love swimming! Thanks for the steel cut oats idea too! I need a good breakfast and this might be what I try! My leader made steel cut oats for us once, and I remember that I liked them, but never bought them. Looking forward to experimenting with them! 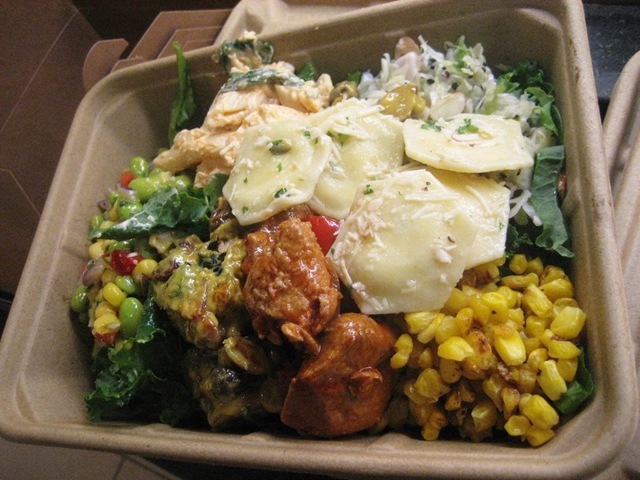 WHOLE FOODS SALAD – OMG!! MY favorite. Hands down. 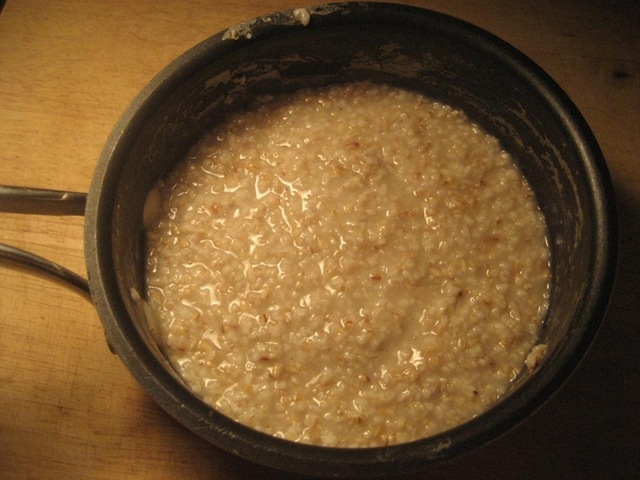 I make a big batch of steel cut oats, put them in containers and freeze them if I know I’m not going to eat it all. Then I just have to heat it up and add my toppings! Just made this. YUM! I ate the whole 2 serving batch though! I added 1/8 t. of coconut and almond extract to the almond joy oatmeal. I will make my steel cut oats this way from now on. I think it’s easier and less mess than the crockpot version. Thanks! 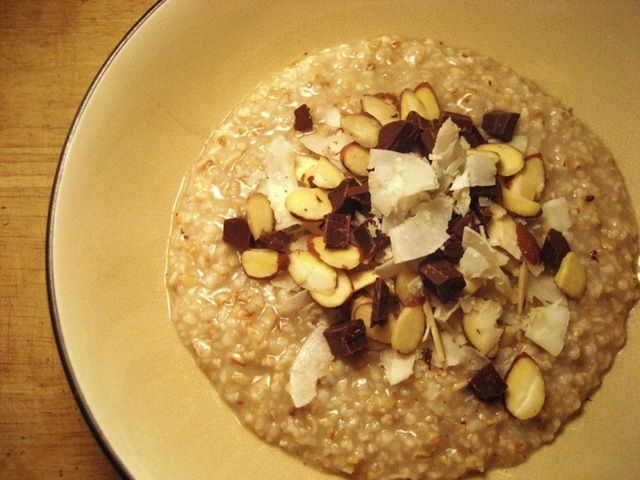 I’m trying this tonight (for tomorrow morning), I’ve never had steel cut oats so I’m looking forward to this! Thank you for sharing!!! Update – had them this morning – loved them!!! Too easy to get ready too – thank you for sharing!